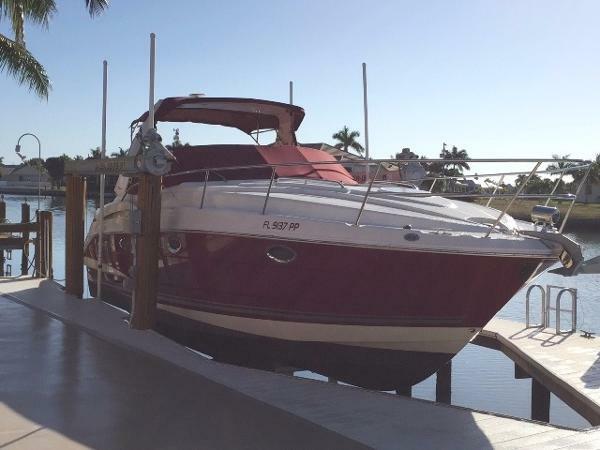 2007 Monterey 330 Sport Yacht This 33 Monterey is been kept on a boat lift its entire life with a full cover from Stern to windshield. Features style, comfort and performance. The cockpit is roomy with a wet bar, companion lounge, double wide helm seat, walk thru windshield and an extended swim platform. The cabin has cherry woodwork and plenty of headroom. Generator and A/C. See full specs and call American to view this boat. 2008 Monterey 330 Sport Yacht INDOOR RACK STORED / FULL SERVICE RECORDS This 330 Monterey Sport Yacht is in near showroom condition. Gray gel coat shines like new while the interior looks nearly untouched. Excellent opportunity on this desirable layout. Just over 500 hours on twin 5.7 Volvos. (First 450 hours of use on fresh water lake in Georgia ) Full Service/ Fluids changed, 4 new Batteries, New Tachometer, Kohler Generator, New Garmin 7610 GPS w/ Vision 2 Chart, Garmin 18XHD Radar, Horizon GX1300 VHF Radio, RayMarine 140 Bi data instrument panel, NMEA Starter Kit / Transducer in hull, Clarion M-303 Marine Stereo w/ USB/AUX ports & MW1 remote, Upgraded Marine speaker system, Satellite Radio & Antenna , Search Light, Under Water Lights, Full Galley with Microwave, Twin Burner Cook Top, Stainless Steel Refrig , Three Flat Screen TVs , DVD player, . The cockpit features a bracket for outdoor TV, Transom Mounted Gas Grill , Stainless Steel Refrigerator, Sink . Full canvas protects the cockpit .Great Bow Sun pad for Tanning.. Super Clean, Pristine condition, Loaded Boat. Bring all serious offers! 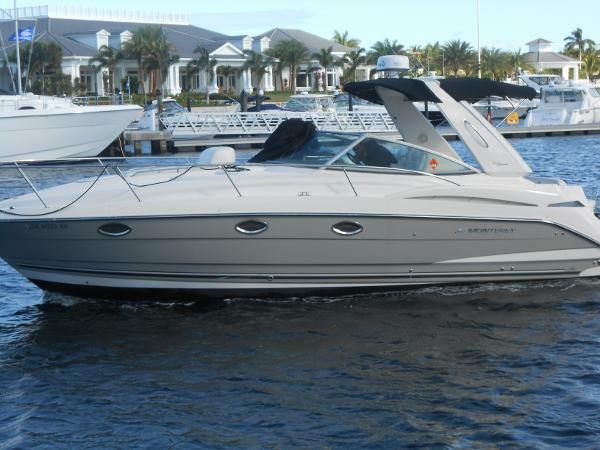 2007 Monterey 330 Sport Yacht MANUFACTURER PROVIDED DESCRIPTION: While piloting the Monterey 330 Sport Yacht, you'll feel as if she was designed specifically around you, as comfort and style meet performance and exhilaration. Engaging lines, luxurious styling above and below deck and a persona all its own make this amenity-filled vessel a dream to captain. Some of the features of the 2007 Monterey 33' Sport Yacht include: (1) Ergonomically designed Command Center houses a full instrumentation of navigational aids, including a digital speedometer, depth/seawater temperature gauge, compass and tachometers. (2) Helm Seating: Dual helm/companion seating with both flip-up thigh rises and fold-down arm rests have storage compartments underneath. (3) Sun Lounger: the built-in chaise lounge with a contoured backrest is perfect for sunning. (4) Cockpit Seating: the oversized cockpit area features an aft U-Lounge with fiberglass bases, a sun island feature and storage below. 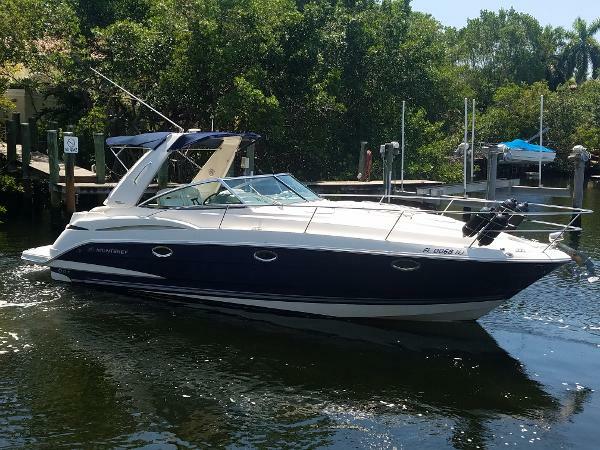 2007 Monterey 330 Sport Yacht While piloting th 330 Sport Yacht, you'll feel as if she was designed specifically around you, as comfort and style meet performance and exhilaration. Engaging lines, luxurious styling above and below deck and a persona all its own make this amenity-filled vessel a dream to captain. Helm: The ergonomically designed command center houses a full instrumentation of navigational aids, including a digital speedometer, depth/seawater temperature gauge, compass and tachometers. Sun Lounger: The built-in chaise lounge with a contoured backrest is perfect for sunning. Helm Seating: Dual helm/companion seating with both flip-up thigh rises and fold-down arm rests have storage compartments underneath. Cockpit Seating: The oversized cockpit area features an aft U-lounge with fiberglass bases, a sun island feature and storage below.